New classroom teaching models are changing how students learn. 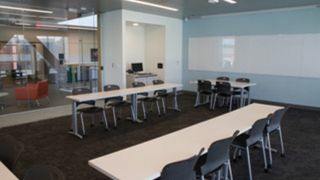 At William Paterson University in Wayne, New Jersey, instructors are embracing the newly installed active learning classrooms (ALC) in the school’s new building, University Hall. These classrooms are designed to foster interactive, flexible, student-centered learning experiences. Unlike a traditional lecture hall, there is no front of the classroom where instructors stand to lecture on course material. Instead, instructors move freely around the room—coaching and interacting with the students who are grouped in clusters of tables where they have access to technology that allow them to easily present their work to their peers. This new teaching platform enables instructors to help their students demonstrate a process, analyze concepts, and apply the learning material to real-world situations, encouraging more dialogue than a traditional classroom. A crucial part of making these kinds of classrooms successful is granting instructors quick and easy access to the technology they need to control and send content on the fly to the displays at each of the student tables. Selecting the right piece of furniture that was not only approved by the architect but was built for AV wasn’t easy, but the school says that Middle Atlantic’s C5 Credenza alleviated the headaches that often come when working on a new build. The available options were mostly limited to desks, a solution Deputy CIO Sandy Miller specifically wanted to avoid because it would have made the room look and operate too much like a traditional lecture room. Instead, Miller requested a more inconspicuous piece of furniture that would centralize all the technology while providing instructors with a user-friendly operation base. Middle Atlantic’s C5 Series Credenza provided the perfect balance of look, functionality, and flexibility. Once O’Donnell had selected the size and style of frame he needed, Middle Atlantic built, assembled, and shipped the frame immediately — an exclusive Middle Atlantic feature that the company calls Frame to Furniture™ and really saves time on the job. With the frame ready, it was down to selecting on the wood skins, which simply snap onto the frame once they were ready. In addition to easing the design process with Frame to Furniture, Middle Atlantic also provides configuration tools that are available on its website. The tools enabled O’Donnell to confidently design a two-bay frame using the program’s built-in intelligent pre-selected options that provided him with the appropriate components to mount a PC, document camera, and VCR/DVD combo as well as a laptop connection within the rack. It also allowed him to build in plenty of room for any future rack additions. All the inputs and outputs for the room feed to an 8x8 switcher also housed within the credenza and a driving component for the rack frame. With a depth of about 19 inches, O’Donnell discovered that, as he loaded up the rack within the system, he need to size up to the 24-inch credenza model. With the website’s configuration tools, O’Donnell was also able to set up the rack elevations and add them to the school’s bid specification when the installation when out to public bid. The elevations allowed integrator TBS Network Intelligence, which won the final bid, to be on the same page throughout the project and prevented some headaches down the road. With its polished look, the C5 Series Credenza blends so well into the aesthetic of the classroom that instructors and visitors are surprised to learn it’s housing all the rack equipment. The brand-new ALCs have had such positive reviews from the faculty that the school is currently looking into converting one of the classrooms at its satellite campus. Because of this great experience with Middle Atlantic, O’Donnell wants to install the C5 Credenza in the new ACL but he also has his eyes on Middle Atlantic’s new Hub collaboration table for the students. The Hub, which wasn’t available when O’Donnell specified the tables for the main campus, is specifically designed for ACLs and ships fully assembled with cable management, power, and mounting systems already integrated — shaving off critical time and errors on the job.